Sometimes blocked drains are caused by problems with the drain itself. Broken, collapsed drains or root intrusion will all have a detrimental effect on the flow of your waste water. 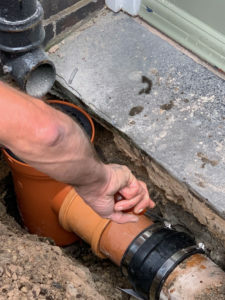 Here at Brisk Services we have repair teams on hand to carry out both conventional excavation and repair of drains, but also no-dig drain re-lining, wherever this may be possible of more convenient. Call your local office now to discuss your requirements in more detail or to arrange a site visit to enable us to provide an in-depth quotation. An example of drain excavation with an effective repair to a damaged drain gulley.